Image taken while it was still mentioned on the PCCP of Minor Planet Center as object VF32D64 on 31.75 march 2014 by use of a remote telescope from Sidings Springs - Australia of the iTelescope.net network with a 0.51 f/4.5 reflector and Luminance filter. Object was clearly a comet with a more circular coma of about 19 arc. sec. Data obtained from five co-added stacked images of 120 sec. Each.Cbet nr. 3840, issued on 2014, April 01, announces the discovery of a comet (~ magnitude 18.6) on CCD images taken on 2014, March 29.4 by R. E. Hill with the Catalina Sky Survey's 0.68-m Schmidt telescope. 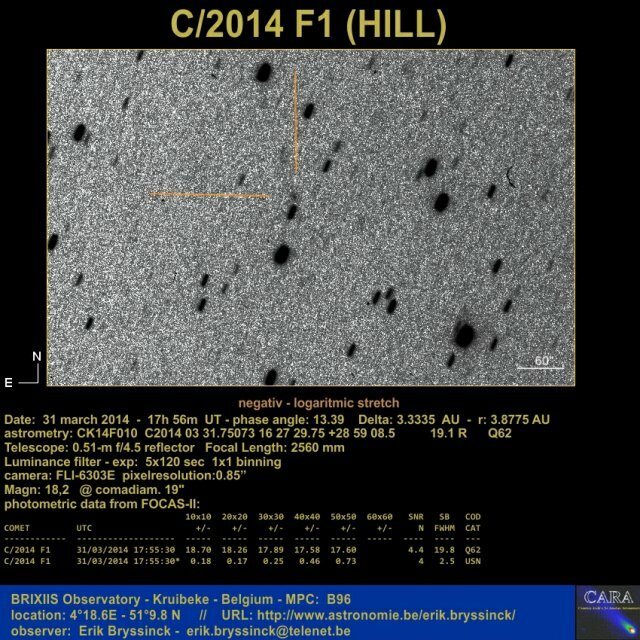 The new comet has been designated C/2014 F1 (HILL).